As a veterinarian and member of the AVMA and AHVMA, I would like to provide this information. This is the best we've got, but it's enough evidence to make most vets take notice and share the info with their clients. 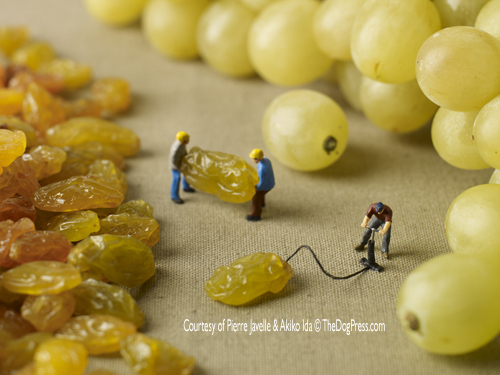 Grapes and raisins may not make good treats for dogs and cats. This FAQ will help you understand the dangers. Grapes and Raisins can Kill! Recently, veterinarians have recognized a new toxicosis in dogs. 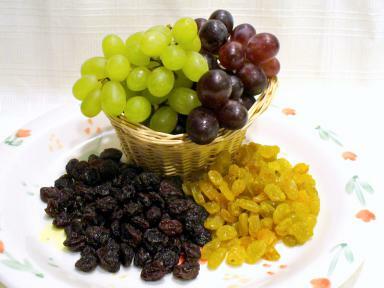 Severe acute renal failure (Grape Toxicity) following ingestion of grapes or raisins (sultanas). What causes it? The specific pathogens involved in this toxicosis have eluded identification. Fungal, pesticide, and heavy-metal etiologies have been ruled out at this time. Investigation continues. It appears from recent unpublished data that the toxic component is water-soluble, and within the flesh of the grape/raisin, not the seed. There are reported cases in dogs, and anecdotal evidence that cats may be affected. Most cats will not readily eat grapes or raisins, but one discussion on VIN suggests that this can happen (Cat, Raisin Poisoning). Birds do not seem to be affected (otherwise we would have no crows feeding on vineyards!). However, smaller amounts could also cause problems - we really don't know exactly what the minimum dose is. Also, not every dog or cat is susceptible - many animals can tolerate large quantities of grapes or raisins without problems. Nobody knows what the patient risk factors are (other than ingestion). What about Grape Seed Extract or grape juice? This appears to be safe. 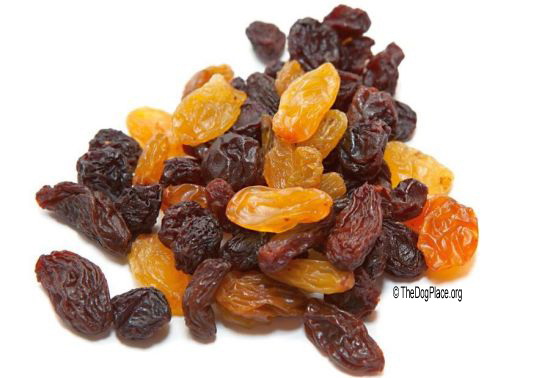 (Grape/Raisin Toxicity & Safety of Grape Seed Extract) Toxicity has been associated with seedless grapes, so the toxin is unlikely to be within the seeds. It is then possible that grape seed extract is safe to use. There is no information about grape juice. However, since the toxic agent is not known, and we don't know if heat will inactivate it, current recommendations are to avoid giving grape juice to dogs or cats. Treatment for acute ingestion (e.g. emesis, activated charcoal) followed by diuresis at twice maintenance for 36-72 hours should be instituted for observed acute ingestion. Renal function should be monitored for several days. If there is no renal damage after 3 days, the animal will likely remain unaffected. If ARF (Acute Renal Failure) develops, specific and supportive treatment should be instituted. Some dogs will develop hypercalcemia with the ARF - this should be treated by diuresis, as it can result in dystrophic mineralization of various organs. The prognosis in cases where renal failure develops is guarded at best. Prognosis is good with early decontamination and fluid therapy. Histological examinations may show death of renal tubules, but preserved basement membrane, suggesting that if the animal can be supported through the renal failure, tubules should regenerate and recovery is possible. 1. Bartges J. There's Nothing "Cute" About Acute Renal Failure. Western Veterinary Conference 2002. 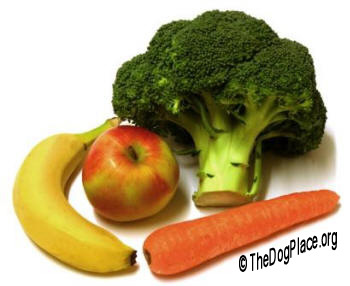 2Dogs are 10,000 times more likely to die in surgery than by "Killer Grapes"
2Dog require digestive enzymes, here's where they get them. 2Owners give grapes to dogs, then Poison Control says "POISON"?